When believers from one culture introduce the “unchanging gospel” to people of another culture, how do they keep the Good News from being dismissed as a foreign import? The short answer is one word: Contextualization. Having the gospel “make sense” to people of a culture does not, of course, mean everyone will rush to embrace it. People must decide if they are willing to make the changes necessary for Jesus to be their Savior and Lord. That does not mean, of course, that people must abandon their ethnic or cultural identify to follow Jesus. Authentic contextualization is based on the premise that when people allow Christ’s transforming power into their lives, they will be even better Nicaraguans or Japanese or Bulgarians or Navajos than they were before. Contextualization does not mean robbing the Gospel of its essence or “watering it down” to make it more palatable. On the contrary, good contextualization renders expressions of the “unchanging Gospel” more faithful to Scripture than they would otherwise be. Holy-Sprit-led contextualization allows Scripture to be as powerful and transformative in each cultural context as it can possibly be. Proper contextualization moves gospel proclamation past a sense of foreignness to allow each people group to hear God say: “This is my design for you.” Contextualization allows people of a culture to see that Yahweh, Creator of the universe who reveals Himself in Jesus Christ, loves them and wants a relationship with them. In tangible terms, contextualization involves the wording of theological expressions as well as things like sermon illustrations, music styles, artwork, decision-making, lifestyle choices, church programs and schedules, modes of preaching and teaching, the process of discipleship, evangelistic outreach, leadership selection and even architecture. Authentic contextualization must travel on two rails. One rail is an unwavering faithfulness to Scripture. The other rail is that of communicating and living out the Word of the Lord in ways that are familiar to people in a particular cultural context. Every leader and church needs to discover who you are and what you’re called to do. Then, do that and be that! Giving people something worth committing to isn’t a matter of competing with the big church down the street. It’s not about offering nicer facilities, bigger events or even better preaching. It’s about discovering what God has called you and your church to be great at, then being great at that. Excellence isn’t limited to churches with big budgets. There’s no excuse for second-rate. It costs no more time or money to do it right. It just takes a full commitment. No one wants a relationship in which one side does all the talking. We have TV and movies for that. But even TV and movies are giving way to social media. One of the best parts about watching a show that has some social media buzz is chatting about it on Twitter and Facebook as it airs. People want to engage with others, not just sit passively while someone else talks. Sadly, the church does not have a reputation of being open to dialog – or to hard questions. And definitely not to criticism. No, you don’t have to turn your sermon into a discussion group (although, some churches do that with great success), but there needs to be an easy and obvious way for people to engage, dialog, chat, hang out and feel like their life and their opinion matters. And leaders, especially pastors of small churches, need to be engaged in those conversations. Listening, participating and learning, not just teaching. I communicate, minister and lead much differently today than I when I started in pastoral ministry 35 years ago. In fact I do it differently than I did just ten years ago. And I expect to change at least as much in the next five years. I now have over 30 years of ministry experience in addition to my formal ministry training. But that experience matters less today than it ever has. If I’m not constantly learning, listening and growing, I’ll fall behind very quickly. But that shouldn’t intimidate us. Learning and growing is Discipleship 101. It’s central to being a follower of Jesus, let alone a church leader. Jesus never made discipleship easy. He always inspired people to a bigger commitment by calling them to a greater challenge. Too many leaders limit the expectations they have for their members to sitting in a pew and filling gaps in existing ministries. We think we can’t ask more of them because … well … they’re not even doing that! But a lot of uncooperative church members and recently unchurched people aren’t as disinterested as we think. Like some of the rowdy kids in school, they’re not skipping class because we’re asking too much of them. They’re acting out because they’re not being challenged. People are deciding that leaving church is better than being bored in church. I don’t blame them. If we don’t challenge people through a genuine experience of worship, fellowship, discipleship and ministry, they’ll do one of four things: 1) go to a church that challenges them more, 2) go to a church that entertains them better, 3) show up physically, but disengage in every other way, or 4) stopping going to church entirely. If you ask small, you’ll get a small commitment. Ask large and your joy might be full. People who don’t go to church, don’t want to go to church. They’re not rolling out of bed late on Sunday morning wishing they had somewhere more churchy to be. In fact, a growing number of people who do go to church don’t want to go, either. If we don’t give them something worth committing to, they’ll be gone soon. It’s not that people are less capable of making commitments than they used to be. They just commit differently. But too many churches haven’t caught up to that reality. So how do we get people to commit to the church / ministry we lead? Especially when our church is small and struggling? I don’t have all the answers, not by a long shot. But I’ve learned a handful of principles over three decades of ministry that have helped our church become a place people are excited to be committed to. These steps won’t cost you any extra money and very little extra time – the extra time because of the learning curve. It’s not about adding to your already limited schedule and overtaxed budget. It’s not about doing things bigger. It’s about focusing on doing church better. Working smarter, not harder. But first, despite the title of this post, the challenge before us isn’t about getting people to go to church. If your focus is trying to get people to commit to your Sunday service schedule, your denominational preference, maintaining your church building or anything like that, you might as well stop reading right now. In fact, you might as well close your church right now. The days of people going to church for anything less than a genuine relationship with Jesus are over. Yes, there’s still a residue of those people, but they’re dying out – literally. And they won’t be replaced by a new group. Nor should they be. But if you want people in your church because you have a passion to help them connect with Jesus and God’s family, read on. 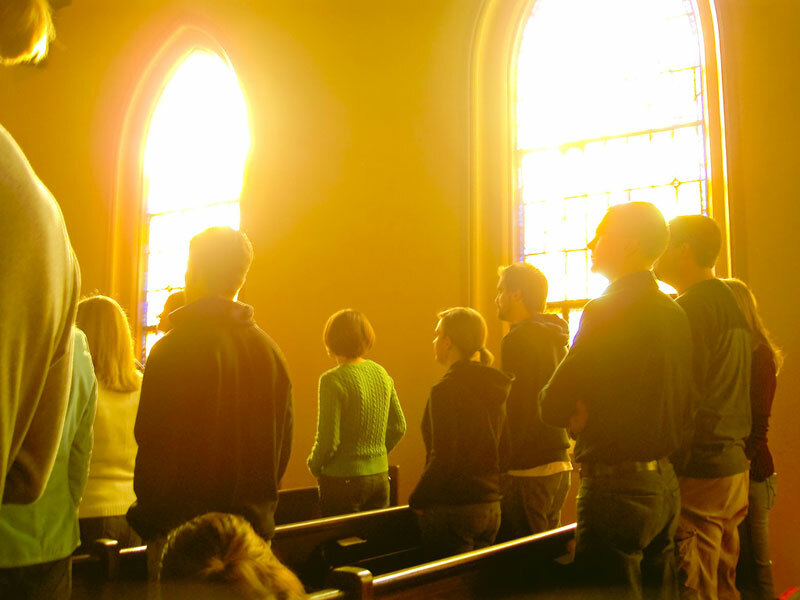 If people continue to go to church, it won’t be because they feel a sense of loyalty to a tradition most of them have never had in their lives to begin with. And it won’t be because they want to be entertained. They have better entertainment on the phone in their pocket than we can ever compete with. The only thing that will get them out of their house and into our churches is if we give them a cause worth living (and dying) for. Namely, an authentic presentation of the gospel of Jesus – through our words and our lives. If your generational traditions or your hip, new staging helps people do that, great! Keep doing it. But if not, don’t let your church’s personal preferences keep people from seeing Jesus. Whether he’s hidden behind stained glass windows or laser lights and fog machines, anything that obscures Jesus instead of revealing him needs to be ditched. For small churches especially, being a church that people want to commit to starts and ends with relationships. We need to help people make connections to Jesus and each other. We need to help people make connections to Jesus and each other. Then work together to build bridges with those outside the church walls. Long after our traditions have grown stale and the spectacle has been replaced by a bigger show somewhere else, genuine relationships with Jesus and people will last. People are far less naïve than they used to be. They can spot phoniness in people very quickly. This is especially important for church leaders, because we have a culture in which respect for leadership is lower than it has been in a loooong time – and mostly for good reasons. Respect doesn’t come with the position of pastor or leader any more. In fact, it’s more likely to be viewed with skepticism than honor. That skepticism will only be overcome by practicing what we preach. You are unique. No one else in the world has your story. And yet, you are part of an amazing community of people with stories similar to yours and stories different from yours, whom you can listen to and learn from. An oldie but a goodie. See them as individuals and develop their gifts. In Mark 3:14, Jesus didn’t just appoint the 12 disciples to go out—he appointed them “that they might be with him.” And Jesus didn’t just bring the disciples around when he was about to teach or perform a miracle. He shared meals with them, travelled with them, and met their families (Matthew 8:14). Take a risk and be okay with mess. If you’re going to take a risk in ministry, let it be on believing in people. Development as a leader is messy and these young people will make mistakes along the way. With your care and guidance, those mistakes will turn into learning opportunities that propel them toward even greater leadership. Stop looking for existing leaders, and start looking for passion and natural influence. When he or she speaks up, do their peers listen? Does they ask questions and demonstrate interest in a particular area of ministry? If so, they are exactly who you need to spend more time with. They might not have experience, but maybe that’s because they haven’t been given a chance yet. Recruit to vision, not to need.